The majority of manufacturing enterprises, almost three quarters according to Aberdeen’s survey respondents, use Enterprise Resource Planning (ERP) as their main business system. However, one aspect of ERP strategy that has always been assumed is that companies strive to have one single ERP system to unify all their parts and processes. 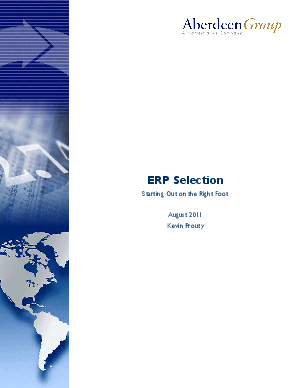 The average manufacturing company in the survey had 1.9 separate and distinct ERP systems. This research will not only show how manufacturers perform based on their ERP implementation, but also look at the impact of the overall ERP strategy. For a limited time, access this sixth annual Aberdeen benchmark report, based on over 120 survey respondents in manufacturing, and explore best-in-class approaches to their ERP strategy and performance.